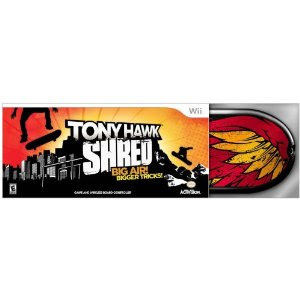 Tony Hawk: Shred for Wii was intended for a younger audience to help them get a “feel” of snowboarding and skateboarding. This game has an innovative motion-sensing controller right at their feel that will make them feel like the pros. It includes the best of the best pro athletes including Lyn-Z Dams Hawkins, Chaz Ortiz, Torah Bright, Travis Rice, and the godfather of skate himself, Tony Hawk! There is never a dull moment with this game since it has larger than life moments, huge jumps and gaps, incredibly steep drops and descents, jaw-dropping tricks that will encourage your children to get off the couch and get into action! Configuring the board with the game is simply easy. Just turn your Nintendo Wii sideways. Therefore, it will be parallel to your TV. After that simplistic modification, you’ll be able to enjoy the ride! – Just step on the board and SHRED. No complicated button controls to master. Just step on to SHRED through awesome modes including Trick, Point Rush, and Challenge! – Go big! Clear huge gaps, perform over-the-top tricks during massive drops, and ride out roller coaster grinds! – All new snowboarding: Feel the rush as you speed down mountain peaks filled with breathtaking big airs, crazy spins, and incredible flips! – Updated Tony Hawk Board Controller with bold, fun design! Use your feet to control the action! This game is rated “E” (Everyone) by the ESRB.